A photo taken in May of German national football players Mesut Özil and İlkay Gündoğan, both of Turkish descent, with Turkey’s President Recep Tayyip Erdoğan, harmed the team spirit of the German National team, sports website Football London said on Thursday. Germany have been eliminated from the World Cup at the group stage following defeat by South Korea on Wednesday, during which Arsenal player Özil was snubbed by his teammates, according to Football London. The two top players came under heavy criticism from Germany's DFB soccer federation and several German politicians for posing with Erdoğan, which was seen as a political campaign tool. The photo was posted on Erdoğan’s leading Justice and Development Party (AKP) official Twitter account during Erdoğan’s three-day visit to the UK. Gündoğan’s shirt had the words “With respect for my president” written on it. “The photo was made public the day before the announcement of the preliminary squad. And it meant that for the first time in Joachim Low’s 12-year-long reign as the Germany coach, things were out of control for the Bundestrainer,” Football London said. Manchester City player Gündoğan later said it was not their intention to make a political statement or be drawn into campaigning for Turkey’s elections held on June 24. They also met with the German president and soccer bosses in May in an effort to defuse a political row. 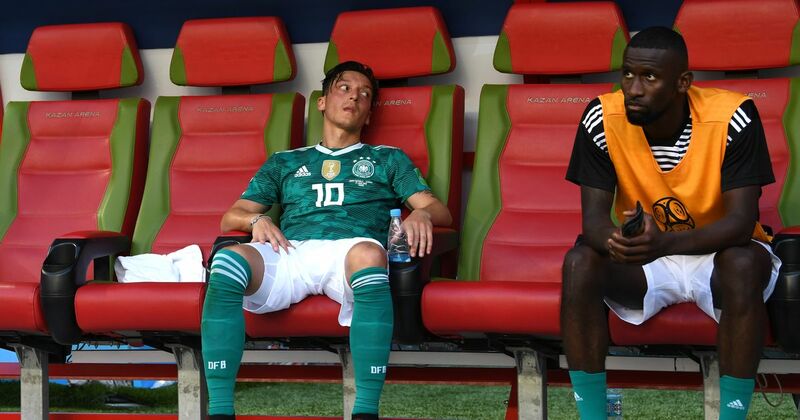 According to the website, Özil and Gündoğan were booed off the pitch in the final test matches before the World Cup and Germany’s biggest tabloid started a campaign against the Arsenal playmaker Özil. “Having already been sidelined at Arsenal since early April, Özil now struggled with fitness and parts of the German media, as well as those former professionals competing for air time with populist statements. Although heavily criticised, and benched for one match, the 29-year-old on Wednesday then was left alone by his teammates,” Football London added.